United Nations Legal Counsel, Mr. Serpa Soares, convened the Office of Legal Affairs (OLA) for a Town Hall meeting. Colleagues from the International Trade Law Division based in Vienna participated via video link. 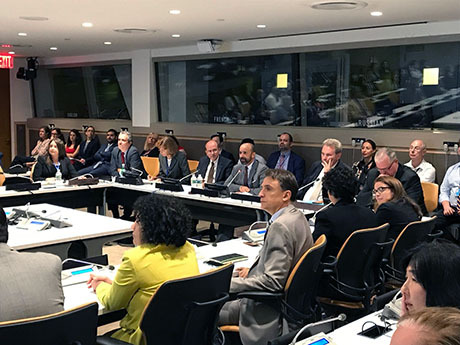 On 4 October 2018, the United Nations Legal Counsel, Mr. Serpa Soares, convened the Office of Legal Affairs (OLA) for a Town Hall meeting. Colleagues from the International Trade Law Division based in Vienna participated via video link. Mr. Serpa Soares recalled the importance of OLA’s role and recognized the commitment shown by the staff to the delivery of the mandates of the Office. The Legal Counsel also provided some insights on the OLA’s results from the Staff Engagement Survey. He highlighted that the rates of participation of OLA were amongst the best of the Secretariat, with a response rate of 89%. Mr. Mr. Serpa Soares informed the participants that his Office has been working very closely with the Heads of Units and other areas of the Secretariat to make the best use of the information received, in particular to act on the identified strengths and opportunities based on the responses and their analysis. The Legal Counsel asked the Heads of Units to continue to be appraised of the inputs of OLA’s staff in the various categories and to keep engaged and involved in the process of implementation of the Action Plan that addresses some of the opportunities identified in the Survey, including in the areas of Collaboration & information sharing; Alignment; Agility and Continuous improvement; Growth and Development; Performance Management and Gender & Diversity. Mr. Serpa Soares shared with those present general updates of OLA, including on several senior appointments. He emphasized the importance of gender as well as regional balance in the Office and provided data that shows the important steps taken in this regard since last year. The Legal Counsel stressed the importance that he places also on linguistic diversity and multilingualism in the Office. The Executive Officer and the Gender Focal Point of OLA provided updates on budget and gender issues respectively. The meeting also included a presentation on the policies and recent developments related to policies on Sexual harassment and Sexual Exploitation and Abuse. The Division for Ocean Affairs and the Law of the Sea provided updates on the state of play with respect to the Intergovernmental Conference on an international legally binding instrument under the United Nations Convention on the Law of the Sea on the conservation and sustainable use of marine biological diversity of areas beyond national jurisdiction. Mr. Serpa Soares then mentioned the importance of fostering an evaluation culture at OLA and stated that to ensure the improvement on the quality of OLA’s management, work and organizational structure through regular and systematic evaluations, he approved an internal self-evaluation policy on April 2017. This Policy establishes the principles and norms guiding evaluation within OLA; and is a management tools to assess the relevance, effectiveness, efficiency, impact and sustainability of the activities, practices, structures and budgets of OLA. The Legal Counsel also referred to the current evaluation of OLA being carried out by the Inspection and Evaluation Division of the Office of Internal Oversight Services (OIOS-IED). He highlighted the importance of this exercise (first of this kind since 2003) and encouraged all to continue the cooperation and collaboration with OIOS. He emphasized the importance of the reports of OIOS as tools for accountability, learning and/or decision-making purposes and to propose recommendations for future action. The Town Hall ended with some 25 minutes of questions and answers. OLA staff took the opportunity to provide questions through an anonymous platform on a wide variety of management, administrative and substantive issues. The Legal Counsel and the heads of units present offered replies and comments thereon.